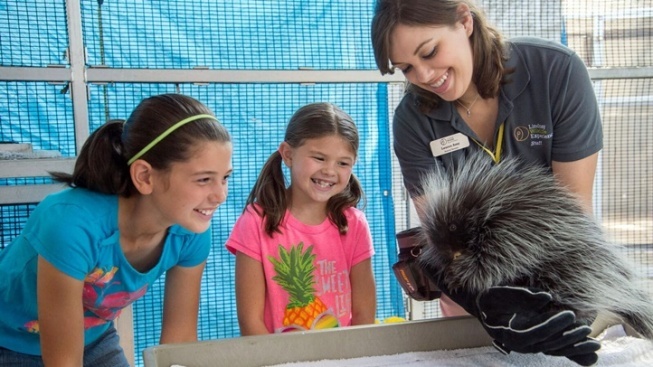 Meet a porcupine, learn about hawks, and love upon nature, in Walnut Creek. SUMMER 2017 SCHEDULE... is out, with plenty of lively, porcupine-a-riffic doings ahead. Oh, did we say "porcupine-a-riffic" just then? In fact we did, because visitors will be able to meet Penelope, the North American porcupine who calls the Walnut Creek animal center home. You can also call upon the Raptor Redwood Grove to admire owls and hawks, and become acquainted with an eagle, and learn more about the on-site hospital (and just what animals are currently under care there, and why). And at 2:30 in the afternoon? It's Flight School, meaning the feathery ambassadors of Lindsay Wildlife Experience will do a bit of soaring for spectators. Everything has a particular time of day — the porcupine-a-riffic doings are up first, at 10:30 a.m. — so study the schedule before heading out, on a path, to the Walnut Creek wildlife-loving location. As for the summer schedule start date? It's Tuesday, June 13.